Be it Jerusalem’s City of David, Megiddo in the Jezreel Valley or any of dozens of other sites, the visitor to Israel is able to match Biblical narrative to geographical location. But where does science end and faith begin? “Biblical archaeology” is a loaded term. For some scholars, the two words neatly dovetail, proving one another’s case, while in the opinion of others, science is often subverted in a quest to prove the authenticity of the Bible. In Israel, the argument has developed along geo-academic lines: Hebrew University in Jerusalem is considered the bastion of Bibliophiles, with archaeologists like Eilat Mazar claiming to have found a 3000-year-old palace built for King David, using verses from 2 Samuel 5 to confirm her claims. Conversely, Tel Aviv University archaeologists are known for doubting whether King David even existed, or if he did, if he was much more than a local chieftain ruling over a village called Jerusalem. 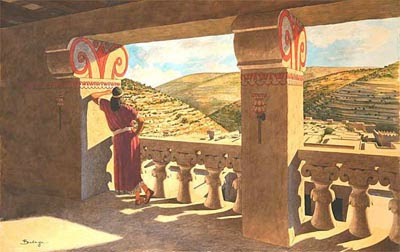 The department, led by Israel Finkelstein, favors “low chronology” dating of ancient cities like Hatzor, Megiddo and Gezer, where Finkelstein contends that structures that were originally attributed to King Solomon and the 10th century BCE (as per 1 Kings 9:15), should in fact be dated to the 9th century. And if a king’s palace doesn’t exist, then it goes to show that the king never existed. The Tel Aviv/Jerusalem spat sets the stage for academic fireworks at practically every press conference announcing an Iron Age (1200-550 BCE) discovery. Watching the controversy unfold from the sidelines makes for fascinating spectacle. All of the players hold strong opinions. After all, if the Bible is God-given, then proving it right or proving it wrong involves much more than simply placing a date on an old pile of rocks. Archaeology in the Land of Israel has always been exploited for agendas that go beyond mere scientific knowledge. Consider this: In 1925, American fundamentalists who objected to evolution being taught in the public schools – and initiated the Scopes Monkey Trial to bolster their position – began contributing funds for the University of Chicago’s excavation of Megiddo, a quintessentially Biblical site. With their biblical faith challenged in a Tennessee classroom, they found succor at a Jezreel Valley archaeology site. It can also be fun to watch the discomfort of the different schools of thought when a significant find is made that strengthens the other side’s case. Yossi Garfinkel’s discovery five years ago of a walled Davidic-era military city at Khirbet Qiyafa on the outskirts of Judea (and just where 1 Samuel says it is) caused a lot of squirming among the Tel Aviv crowd. And Eilat Mazar’s failure to provide ample evidence of her claim to finding King David’s palace in Jerusalem has put the Jerusalem school of thought on the defensive. Everyone in the archaeology profession has an opinion; sometimes it even coincides with the truth. Half of the fun of visiting these sites is detecting the behind-the-scenes story and picking up on the clues of what other motivations are at play. Like everything else in Israel, every historical site boasts multiple layers of past and present.